I don’t know about you, but I’m starting to get really tired of eating Thanksgiving leftovers for every other meal. Fortunately, after last night’s dinner, we’re down to a serving of mashed potatoes, some gravy, and one more chunk of turkey breast small enough to transfer to a zipped sandwich bag. So bear with me for leftover posts today and tomorrow, and after that we should be able to move on from Thanksgiving (to Christmas cookies! No, I jest… sort of). Anyway, I used up more turkey and a bunch of turkey stock last night making a turkey barlotto with dried porcini mushrooms. Barlotto is a variation on risotto made with barley instead of rice—in this case, pearl barley. It’s easier to make than risotto, however: you don’t have to stir it much because, unlike arborio rice, barley doesn’t have the starch content to develop that creamy texture. This recipe is cooked more like a pilaf, with shallots sauteed in olive oil and grains quickly toasted, then simmered in broth until the liquid has been absorbed. I improvised with a splash of cream and Parmesan to give it a more risotto-like creaminess, and subbed in reconstituted porcinis for fresh shiitake mushrooms. Jeremy was really happy with this meal, and didn’t even realize that it wasn’t made with rice until I mentioned it. That impressed me because he isn’t so much a barley guy. He actually liked it well enough that the leftovers (yes, we had more leftovers from the leftovers) will be his lunch today. Put half the oil in a medium to large skillet over medium-high heat. When oil is hot, add shallots and cook until softened, about 5 minutes. Add barley and cook, stirring, for a minute or so, until glossy; add broth, strained liquid from porcini, and salt and pepper. Bring to a boil. Turn heat down to low, cover and simmer for 20 to 30 minutes, until barley is tender (it will not become very soft) and liquid is absorbed. 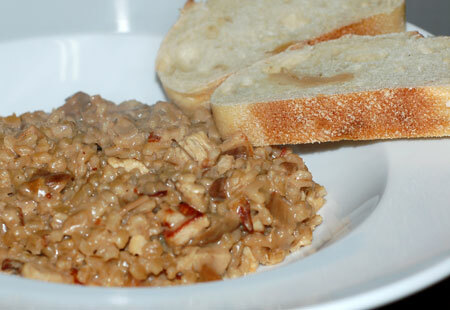 Chop reconstituted porcini and add to barley. Meanwhile, heat remaining oil in a small skillet over medium-high heat; reheat turkey, stirring occasionally, until browned and crisp. Taste barley, and continue to cook, if necessary, adding a tablespoon or two more liquid if all liquid has been absorbed and barley is not yet tender. Stir in turkey, cream and Parmesan, and continue to cook just until all is hot and combined, then garnish and serve. Source: Adapted from Mark Bittman, New York Times.